Mana Pools offers its visitors spectacular views of the mountain and the rift valley escarpment. The abundance of water and luxuriant greenery accounts for the parks wealth of big game. As the mighty Zambezi flows from Lake Kariba through the Lower Zambezi Valley, it creates a huge rift in the earth’s crust. Over the years the rushing waters have created islands, channels and sandbanks within the valley. Abandoned river terraces and small ox bow lakes are surrounded by lush vegetation. These make the pools a natural zoo, where animals reign. Most of the park is accessible by foot, making it perfect for walking safaris. 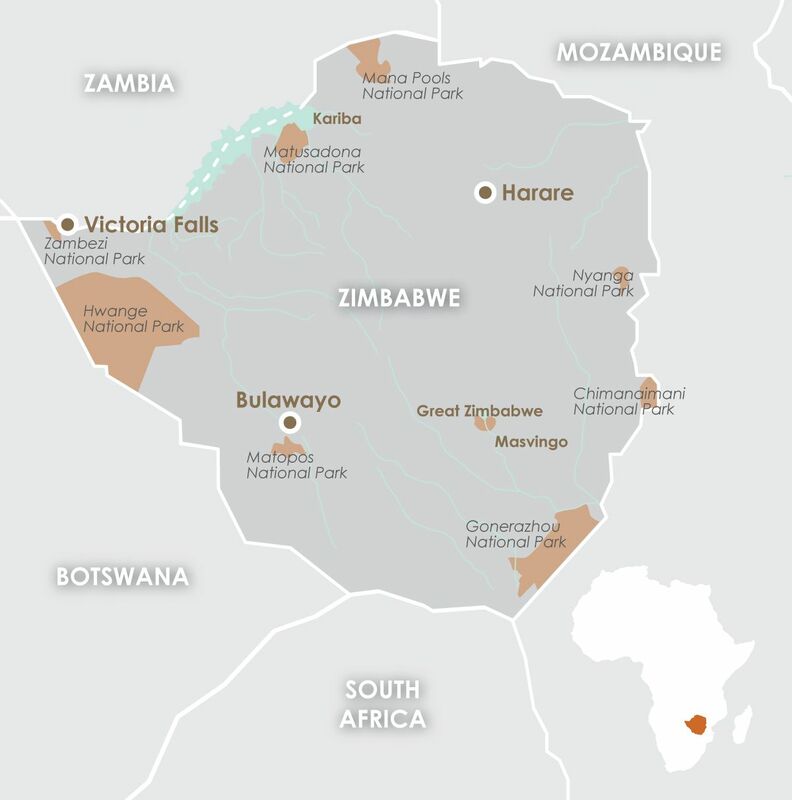 The unspoilt terrain attracts large herds of elephants and buffalos, a wide variety of birds as well as lions, hyenas, kudus, zebras and numerous varieties of antelopes. Visitors also can take in the views from the water upon a canoe safari. This is a great way to see the valley in its entirety as well as gaze upon the big game without disturbing it. The ideal time to visit Mana Pools is between March and August. The moderate temperatures and warm and dry climate is ideal if you are seeking comfort. During the months of September and October game viewing is at its best, as the animals come to the rivers to drink and bask in the sunlight. September provides warm temperatures, whilst October gets hot with clear blue skies. The rainy season runs from November to February, with the air being stuffy and the threat of regular thunderstorms. Thus the beauty of the park is lost under the muddy soil and can only be accessed by 4×4. With the highest concentration of crocodiles and hippos in the country, a water safari is an excellent option to experience these illustrious and dangerous creatures in their natural habitat. The 4 large permanent pools are flanked by forests of mahogany, wild figs, ebonies and baobabs. They are the perfect location to sit and spot a huge variety of mammals and bird species going about their day to day activities. Mana Pools is known worldwide as a premier safari spot. Hence the number of fascinated visitors, who choose the destination year after year, continuously increases.